Municipalities across the globe are faced with depleting freshwater resources due to growing demand, climate change, and deteriorating water quality in aquifers. 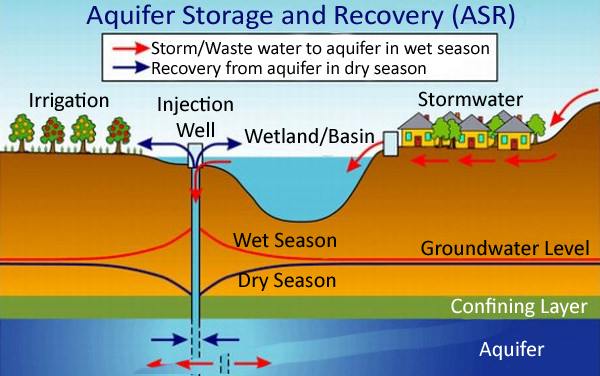 Aquifer Storage and Recovery (ASR) is a viable technology to address this problem in an ecologically responsible manner. It involves storage of treated water from surface runoff in aquifers during periods of low demand, and withdrawing the stored water during dry and peak-demand periods. ASR is a highly economical option to supplement water supply as it can be implemented for a fraction of the cost to store water in above-ground reservoirs. The technology also assists in restoration of streams in stressed agricultural regions, and in managing storm water in urban areas. Our team has decades of experience in the all aspects of design and operations of an ASR system including aquifer testing and characterization, geochemical analysis, geophysical and well surveys, injection well and wellhead design, storage capacity evaluation, chemical and biological treatment, groundwater flow and geochemical modeling, permitting, and optimization of energy and injection schedule. We assist our clients in planning, developing, and operating effective ASR wellfields by conducing feasibility studies and economic analyses, selecting suitable site(s), implementing pilot-sale initiatives, developing monitoring and operating plans, provide construction oversight, analyze/interpret monitoring data, and conduct post-injection audits to optimize operations.